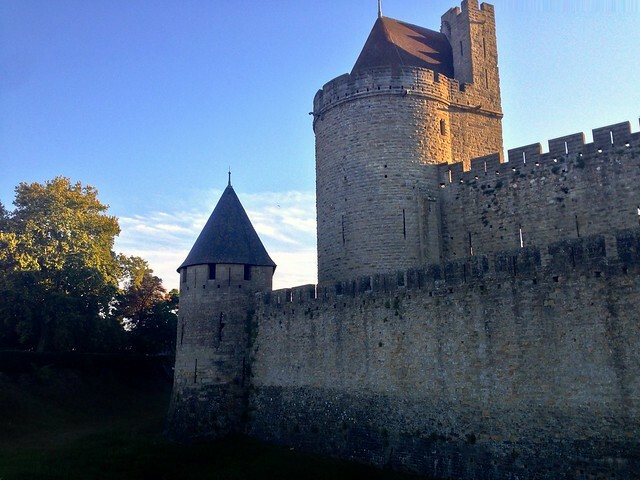 In Carcassonne, we stayed at the Inter-Hotel Les Oliviers, a modern-looking suite hotel just a few blocks away from the Old City. After many days of hiking and tenting among increasingly beautiful textures and charming decay, it was a relief to stay in a place with plain white walls, modern conveniences, and utilitarian furniture. 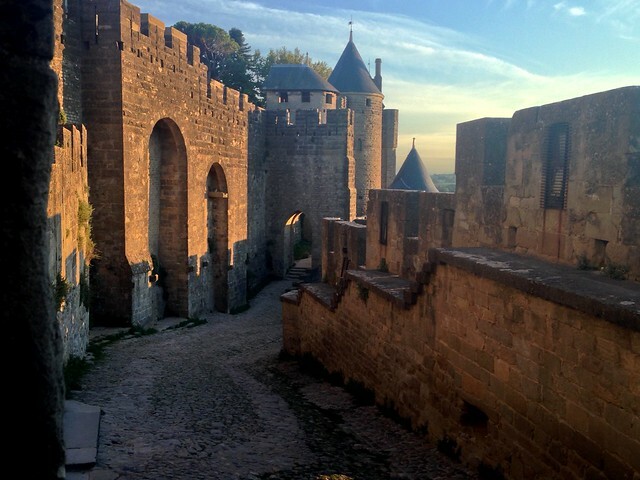 There is no charge to enter the Old City of Carcassonne, so we spent our time in town napping at the hotel and wandering over to explore the more-or-less medieval old city. As a votary, always, in the first instance, of a general impression, I walked all round the outer enceinte, - a process on the very face of it entertaining. 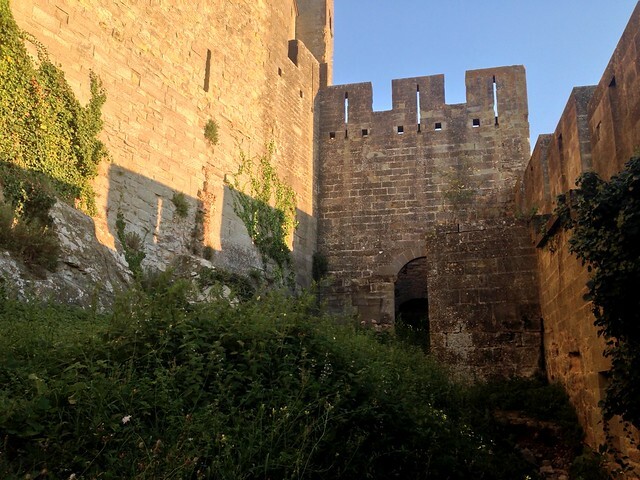 I took to the right of the Porte de l'Aude, without entering it, where the old moat has been filled in. 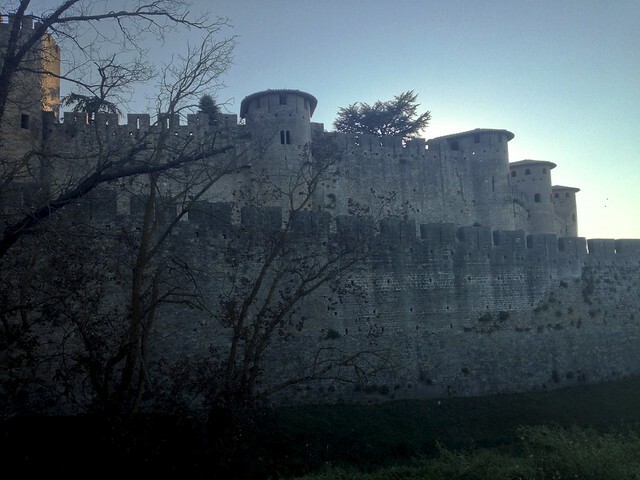 The filling-in of the moat has created a grassy level at the foot of the big gray towers, which, rising at frequent intervals, stretch their stiff curtain of stone from point to point. The curtain drops without a fold upon the quiet grass, which was dotted here and there with a humble native, dozing away the golden afternoon. 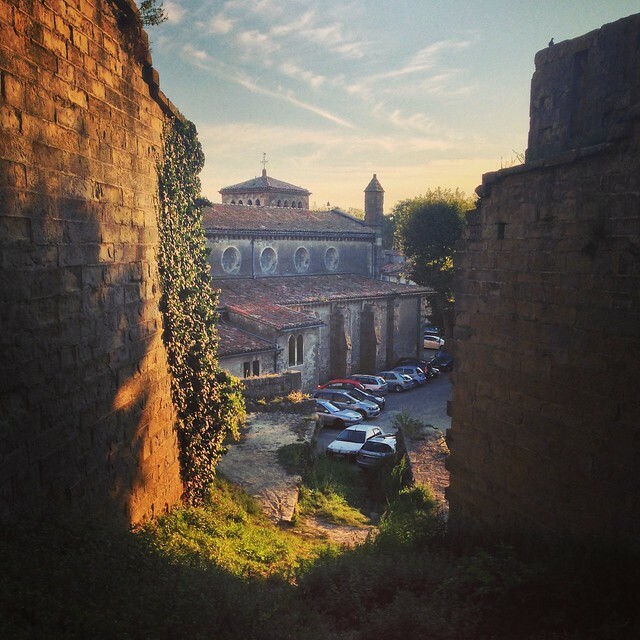 So I decided to take an evening walk around the walls of the city. I didn't see any dozing natives (only a few dozen people actually live inside the old city now) but some kids nearly ran me over on their bicycles as I started my circuit of the walls. 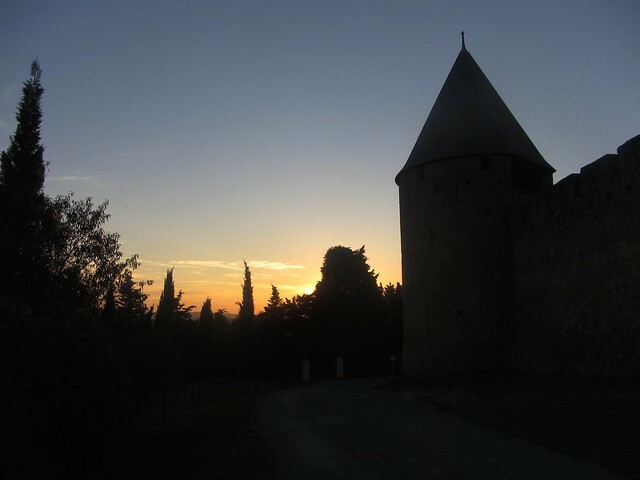 We had been treated to beautiful golden sunsets almost every night here in Languedoc, and I could tell that tonight would be no different. I had a feeling that this would be a special walk. I was right - and I'm glad that I brought my camera. 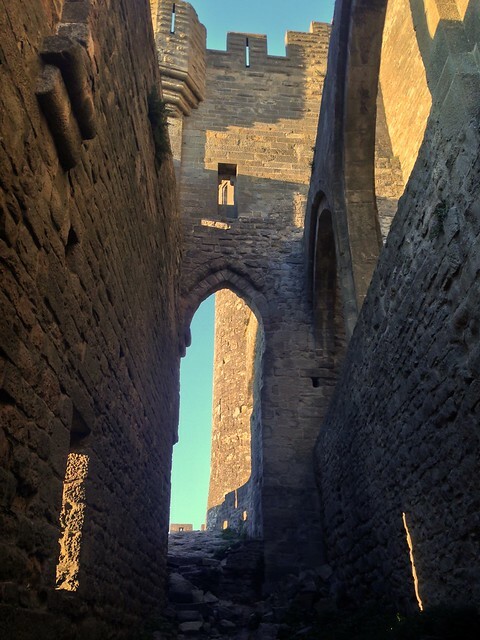 After the first turn I came upon perhaps the oldest part of the fortifications, where the inner walls are punctuated by the original Visigoth towers, built in the Roman style in the fifth century. 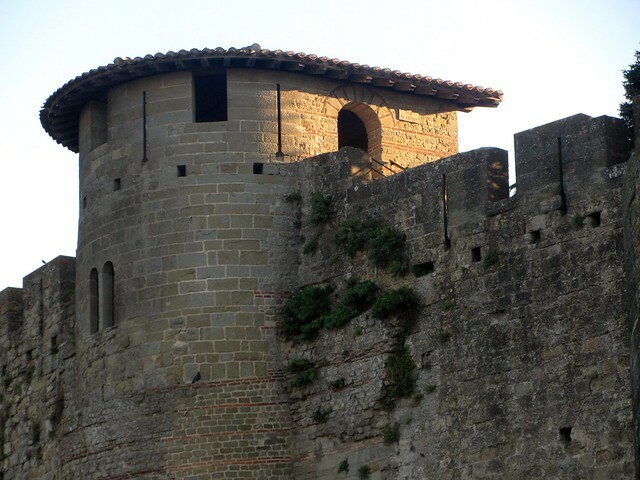 For some reason I grew very fond of these ancient towers in my time at Carcassonne, with their hat-like tile roofs and alternating rows of bricks - a style I had last seen in some of the older parts of Istanbul. 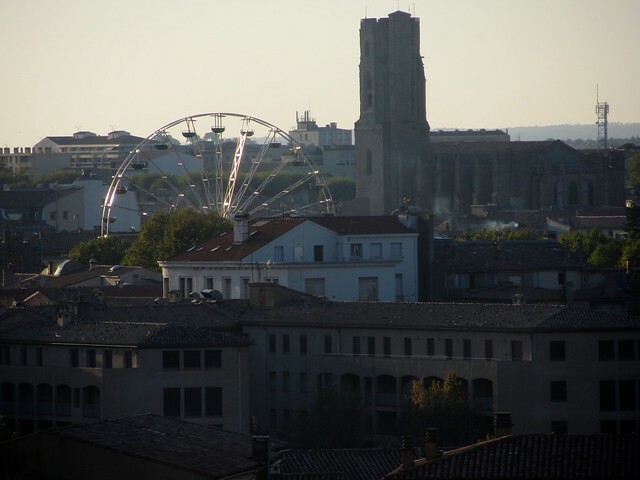 They were not looking out at invading armies of Moors, Crusaders, or heretics, but instead a rather pretty sunset view of the newer parts of Carcassonne, dominated for these few late-summer days by a giant "eye" ferris wheel. 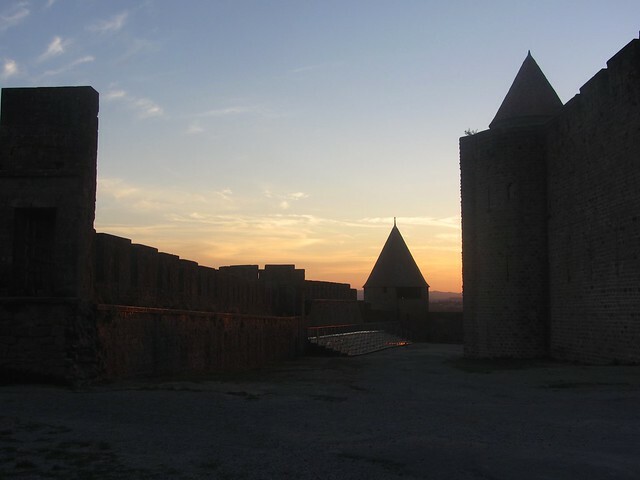 I rounded a corner and found a section of the walls that was directly facing the setting sun. I guessed that this part would only get more dramatic in the next while, so it would be worth lingering. Lingering didn't turn out to be an option after all: halfway along, a spur of the fortifications went all the way down-hill to the town below, and to get through I had to go down and around this spur. 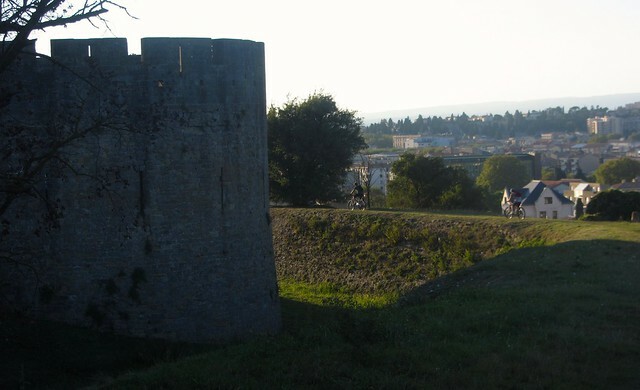 According to Viollet-le-Duc's book, this spur connected the rear of the fortress's keep to a fortified bastion at the foot of the hill. 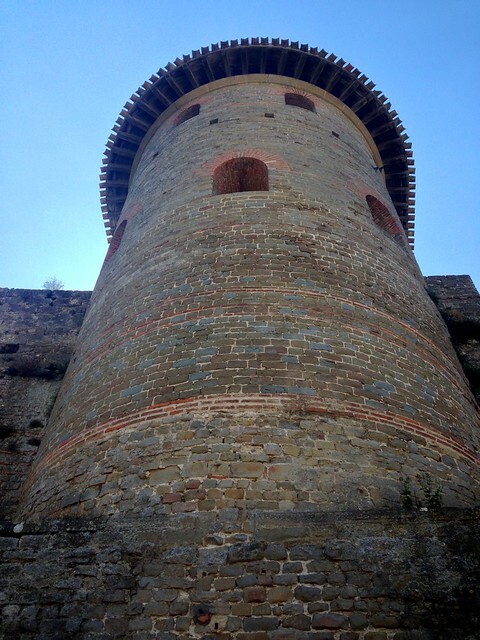 This gave the defenders access to the town so they could sally forth and attack their enemies from behind (or maybe quickly escape an attack from the other side). The bastion is long gone, but has been replaced by a parking lot and, more notably, a lovely church, designed by Viollet-le-Duc himself. 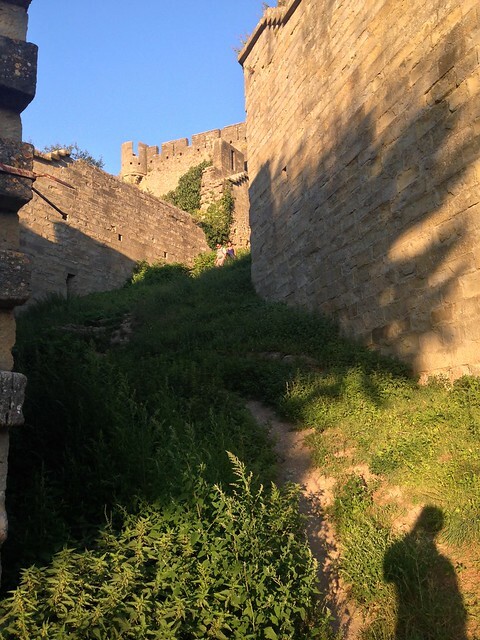 To get back to the main walls, I now had to climb up a passageway that had clearly been designed for maximum defence in case the bastion was overrun. Hardpoints stuck out from alternating inner walls, forcing attackers into an uphill zig-zag pattern, slowing them down to make them easy targets for the surrounding archers. 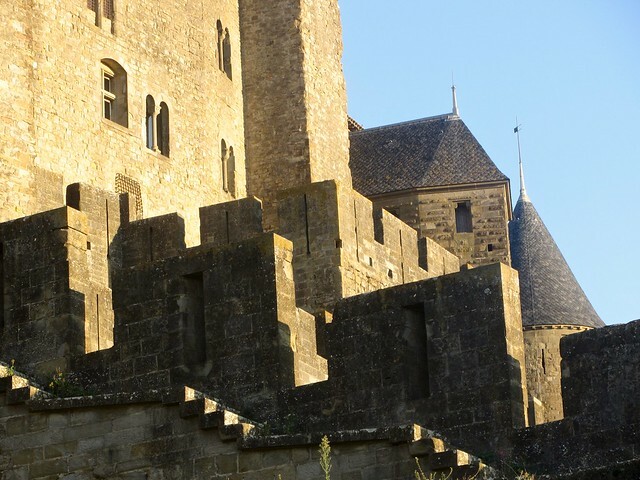 In some alternate universe Carcasonne is not a gentle tile-laying game for the whole family, but an intense Tower Defence video game with a "Game of Thrones" vibe, like an extra gory Kingdom Rush. 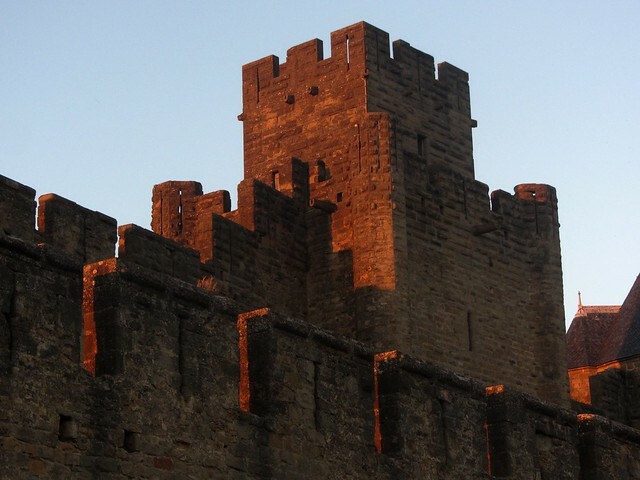 By the time I made it to the last turn, the sunlight was coming in almost horizontally, casting shadows of the outer walls onto the inner walls. 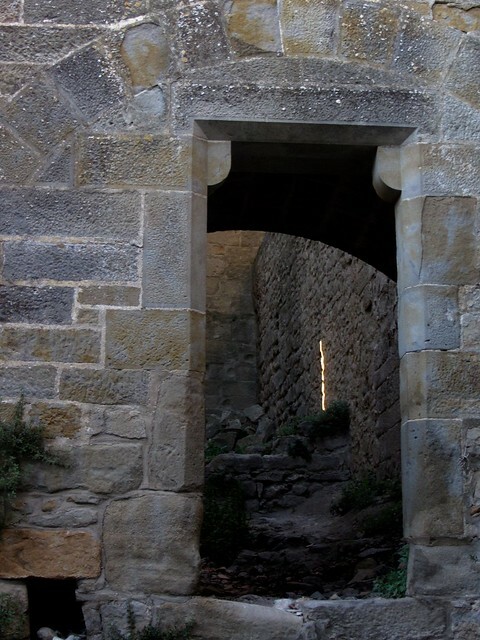 It's easy to forget that these naked stone walls are only the skeleton of what would have originally been here. 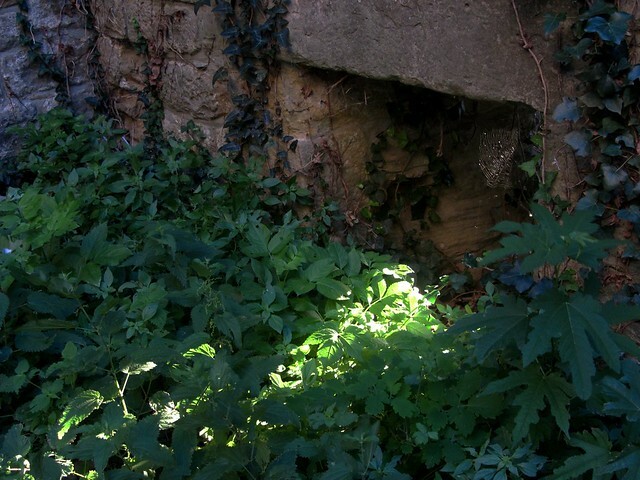 You can see where wooden support beams would have been inserted to support extra fortification structures above and around these stone walls. We should also try to imagine colourful flags and banners flying everywhere too. The naked stone is impressive, but we don't often appreciate how colourful a place like this would have been in its heyday. 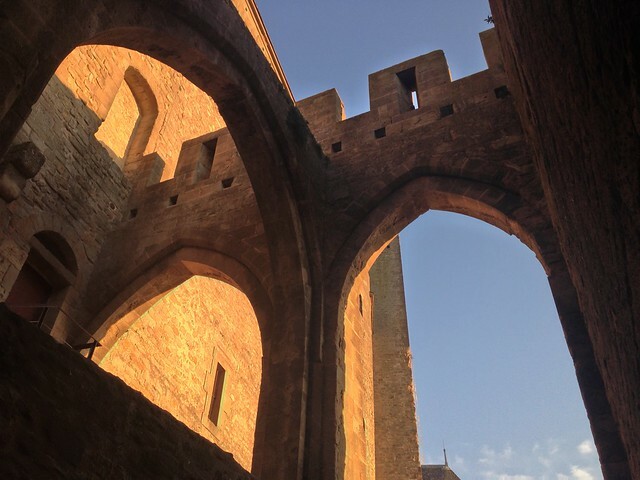 When I finally reached the multi-level vaulted gatehouse, the already complicated and lovely architecture was made even more so by its own shadows falling back on itself. 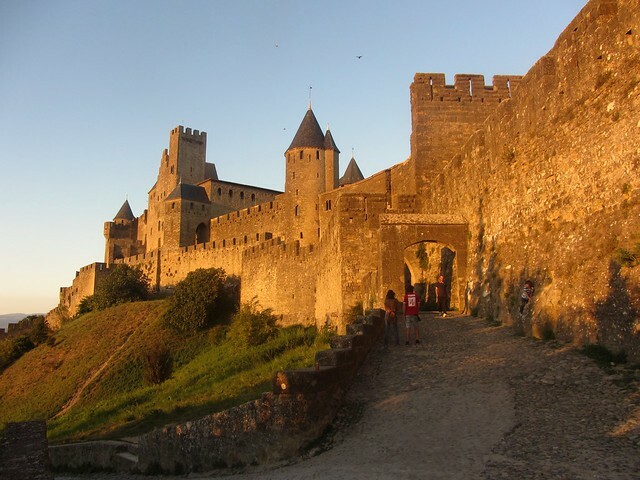 Going down the little road and looking back, I saw a gorgeous view of the walls and keep of Carcassonne, golden in the sunset. 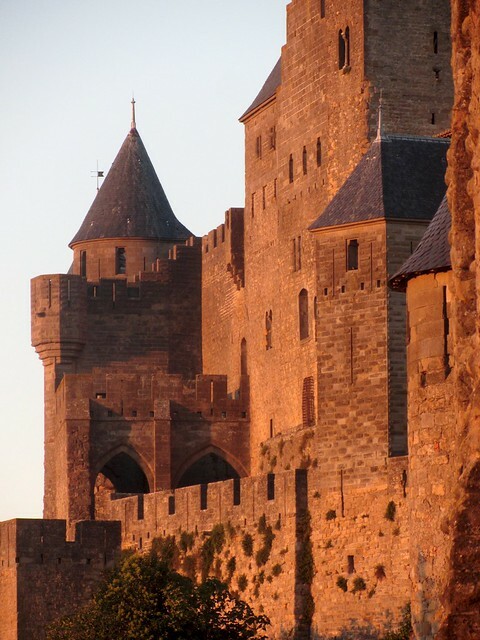 "Carcassonne-game" by Source. Licensed under Fair use via Wikipedia. By the time I reached the next corner, the sun was falling below the trees. The light that reached the towers was now turning a darker and darker red, making them look especially dramatic, if not forboding. 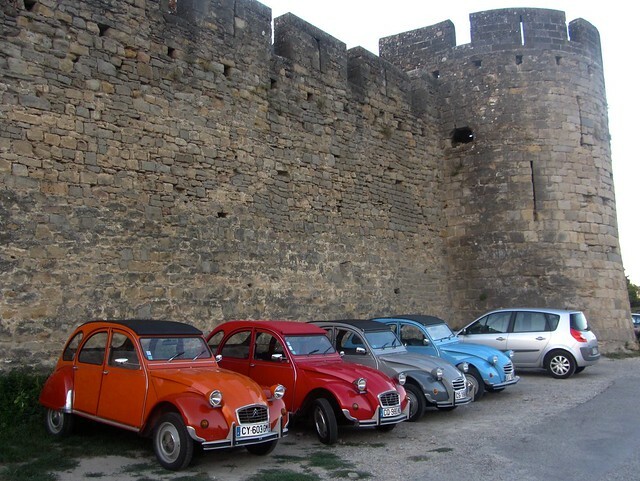 I treated myself, in the most infatuated manner, to another walk round the Cite. It is certainly this general impression that is most striking, - the impression from outside, where the whole place detaches itself at once from the landscape. In the warm southern dusk it looked more than ever like a city in a fairy-tale.